My dad is amazing, I couldn’t have done it! Think about it – so far above the earth, houses are specks and you have to leap out of a plane and free-fall for six minutes. That has to be so contrary to what your mind and every sense in your body is telling you to do. We are proud of you Dad! 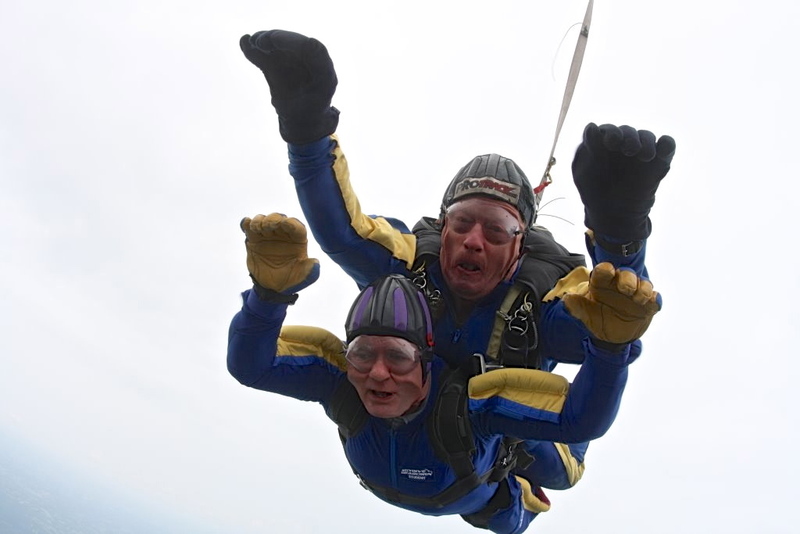 ‘I am sure you will be delighted to know that I completed my tandem jump on Wednesday morning and with the help of your sponsorship I have raised over £1,900 towards The Aspinall Foundations’ Javan Gibbons project. This critically endangered species will benefit greatly from your generosity and will be used to enhance our project in Java. The skydive itself was exhilarating to say the least and a huge adrenalin rush – I would recommend it to anyone. For those still scratching your heads, see the following for the wonderful work they do at the Aspinall parks. Also see this amazing video. This entry was posted in Back home and tagged charity, dad, family, jump on June 28, 2013 by emma. Am loving your blog by the way – I need to get back to mine again. At the moment it is hard to find the space, but it will do me good when I do!